Vintage goldtone Avon ring issued in 1978. 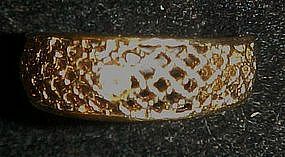 Goldtone ring / band has open lattice work with a center rhinestone. Excellent and shiny, size 9.